Please note, for any US donators having trouble with this page, we're also using https://www.gofundme.com/the-dune-preserve-rebuild-fund for Dune donations. The Dune Preserve, like every shoreline establishment affected by Irma, has been battered by the wrath of the biggest hurricane in the last decade. Situated between 5star resort, CuisinArt, and the Greg Norman 18 hole golf course and preserving 750 feet of sand dunes, the eco-sensitive beach bar, restaurant and concert venue, created by Bankie Banx, is home to music enthusiasts from far and wide. 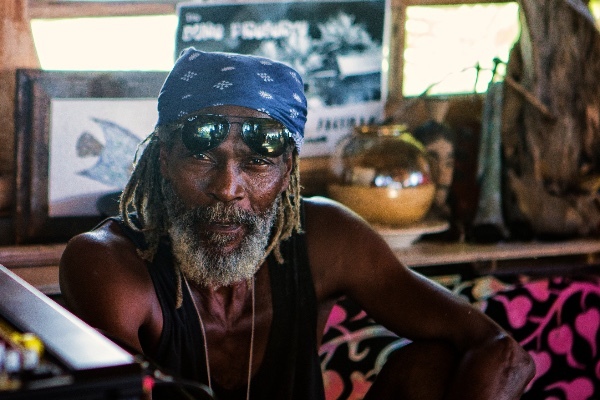 An artistically eclectic establishment that recycles old Anguillian racing boats, driftwood, musical instruments and whatever else Bankie's imagination conjures up! Numerous fans, music lovers, Dune folk and the usual Dune tribe have been reaching out to offer financial support, in an effort to restore Bankie's Preserve, which has been severely damaged as a result of hurricane Irma. We, the organisers, work with Bankie at The Dune, running the bar day to day and/or dealing with annual events such as Moonsplash. Like you, we love Planet Dune and have spent many an hour drinking and enjoying the music, laughing with Banx at the bar. We cannot imagine the island without our magical beach bar, so let's bring the Dune Preserve back to life! ALL funds donated via this GoFundMe page will be used to help Bankie re-built the Dune Preserve. Us again! Apologies, the GFM rules are quite specific and so it requires another update. This account was set up as a UK account and so funds have to be withdrawn by a UK resident. Adaze Ologbosere (me!) works alongside Banx at the Dune, set up this account and will withdraw the funds in her name to her UK bank account (as per the GFM rules dictate). Shortly and as soon as possible thereafter I will transfer the funds to Clement Banks (aka Bankie Banx) to his on island account. I just want to say a huge thank you for your support. GoFundMe requires that I send ANOTHER update before they let us withdraw these funds and so forgive me if I am repeating myself. I run events with Banx and will withdraw the funds using his given name, Clement Banks, and will transfer the same funds to his on island account immediately. He is, as I understand it, still clearing up at the Dune but hopes to be open in some capacity by December 15.